Glen Durrant was among 13 players to secure a PDC Tour Card on the final day of the 2019 PDC UK Qualifying School in Wigan on Sunday. Day 4 (Final Day) The Final UK QSOoM Table is at the bottom of this page. The fourth and final day of action saw almost 400 players return for one last chance to win a coveted two-year Tour Card, with the final two players from each day winning a Tour Card automatically. Ranking points were allocated to players throughout the event to form the UK Q School Order of Merit, with three-time Lakeside Champion Durrant among the 11 players to secure a Tour Card via this method. Competing in his first Q School, Durrant suffered early exits on the opening two days of play, before Saturday’s semi-final was backed up with a run to the last 16 on Sunday to seal his status as a PDC professional for 2019 and 2020. “This is as good as winning the Lakeside Championship,” said former Grand Slam of Darts quarter-finalist Durrant. “I’m going through so many emotions right now, I’m so happy and relieved to get through because there was so much pressure on me to do this. 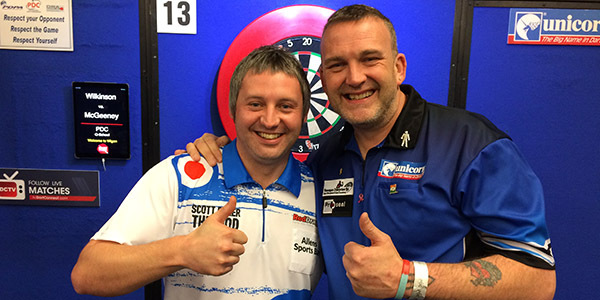 Durrant was defeated by Kirk Shepherd (pictured left) in the last 16, with the former World Championship runner-up going on to record wins over Darren Beveridge and Kevin Painter to seal an automatic Tour Card. Shepherd was joined by another former Tour Card holder, Nathan Derry (pictured right) in the winner’s circle thanks to an impressive 5-1 defeat of Joe Murnan in the final four. Strong displays over the four days from Jonathan Worsley saw him top the Q School Order of Merit to win back his Tour Card, while Carl Wilkinson and Gavin Carlin won theirs for the first time. Experienced Welshman Barrie Bates was also successful in the 11th and final qualifying place, returning to the professional tour for the first time in eight years. There were immediate returns to the ProTour for Joe Murnan and Jamie Bain, while Lakeside Championship quarter-finalist Conan Whitehead also returning to the PDC circuit. Former UK Open semi-finalist David Pallett, Adrian Gray and Andy Boulton also secured their Tour Cards via the Q School Order of Merit. Among the players who narrowly missed out on the qualifying places were Challenge Tour event winner Cameron Menzies, former Players Championship Finals winner Kevin Painter and World Championship competitor Lisa Ashton. 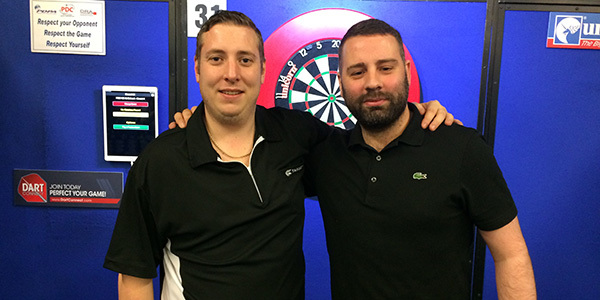 Day 3 – Matt Clark and Reece Robinson claimed Tour Cards on Day Three of the 2019 PDC UK Qualifying School in Wigan on Saturday. The third of four days of action saw almost 400 players return to battle it out to win a coveted two-year Tour Card, with the final two players from each day winning a Tour Card automatically and ranking points allocated to other players to form the UK Q School Order of Merit. Current Top of UK QSOoM Table after Day 3Day 2 – The second of four days of action saw almost 400 players battle it out to win a coveted two-year Tour Card. Competing in his first Q School, former BDO number one McGeeney came agonisingly close to winning a Tour Card on the first day of action, suffering defeat in the semi-finals but went one better on Day Two edging out Carl Wilkinson 5-4 to attain his all-important Tour Card. Baker, who has competed in the last two stagings of the Lakeside Championship, was also successful in his first attempt at Q School. Day 1 – Jamie Hughes and Harry Ward were the two winners of PDC Tour Cards on Day One of the 2019 PDC UK Qualifying School in Wigan on Thursday. CLICK HERE For the 2019 European Tour Qualifying information. CLICK HERE For the 2019 UK Open information.